Collins Plastics are trade sign suppliers, offering a comprehensive range of signage. We Laser Cut, CNC Cut, Line Bend, Vacuum Form, Thermoform, Bend, Glue, Screen Print, Spray, and fabricate all types of profiles from a variety of materials, including Acrylic, Styrene, Foam PVC and Lexan. 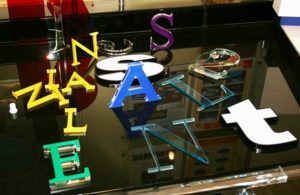 We supply finished signs to the trade and supply a variety of accessories. We can fabricate once off projects or production runs. If you require light boxes, cut out letters, Foamex letters, cut Perspex, engraving, rastering or poster displays, contact us now and we will be happy to discuss your requirements.